This is the title page of John Augustine Waller's 'A Voyage in the West Indies', published in 1820. 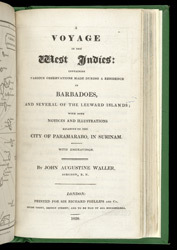 Waller was an eminent surgeon who travelled to the Caribbean in 1807. He describes his first sighting of Barbados, his ship's passage into Carlisle Bay, and his first steps on the island. He speaks of his amazement at the extent of the quayside industry, as well as his visits to the naval hospital where every bed was occupied due to yellow fever. He also describes the large, airy new hospital that was being built two miles from the town.